A Better "AlbumArt" visualization than the one that comes with Windows Media Player. Nothing too fancy, but it shows the Album Art, Album Name, Song Name, Year and shows a small, not too crazy animated visualization in sync with the music. 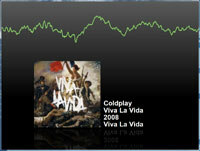 When I listen to music, the flashy visualizations simply get annoying after a while. They are cool, but what a really wanted was to be able to relax and see what is playing at a glance. This visualization is a product of that.